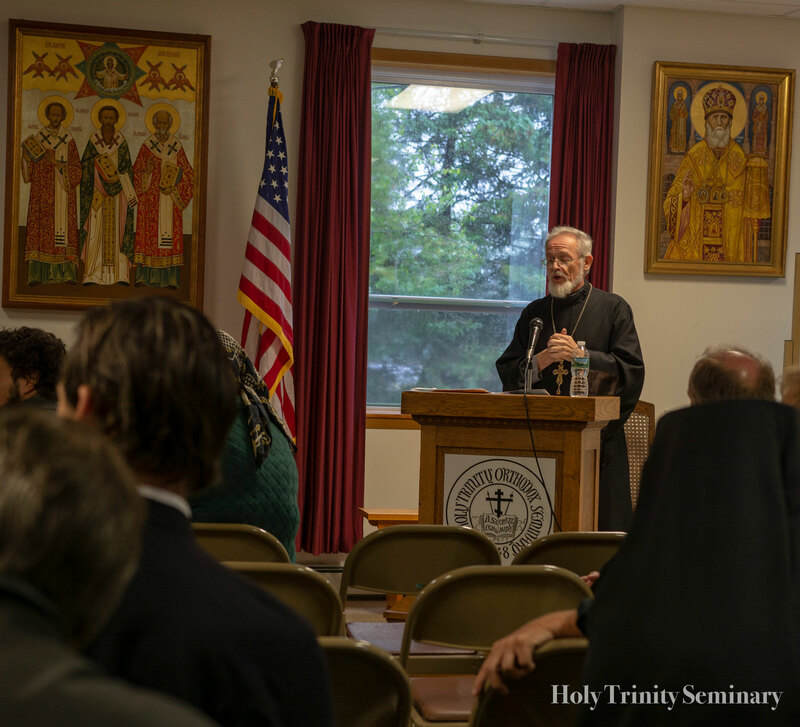 On September 10, 2018, Holy Trinity Orthodox Seminary celebrated its Second Annual Fall Convocation as well as its 70th year of operation. The entire student body and all available faculty gathered together to launch the new school year and meet together for the first time. The sense of collegiality and fellowship resonated among all present. After the opening prayer, V. Rev. Archimandrite Luke (Murianka), rector of HTOS, read Met. Hilarion's message to the cohort of seminarians, reminding them that "today, the good and all-perfect will of God is worked among you, directing you to bear the yoke of Christ through service to the world and to man." Although it is crucial to remember that a Seminary graduate must share the treasures of a seminary education with the world to raise it toward God, "what, however, can he offer people, if he himself does not strive for personal perfection?" It is only with this balance of spiritual development and a service orientation that the seminarian can harness and direct his "young and vibrant forces" to "fulfill [the Church's] ministry in very difficult modern conditions." After all the students were introduced to rousing applause, it was the faculty’s turn. Fr. Alexander began with a "Hail and Farewell," remembering the faculty who have moved onto other employment (Archpriest Peter Heers and Prof. Elena Nelson) and welcoming new faculty (Rev. Fr. John Boddecker and Instrutor Elizabeth Purdy). Each professor or instructor in attendance addressed the gathering for ten minutes. Fr. John brings an unusual (for an Orthodox) training in Hebrew, Syriac, and Aramaic to his teaching of the Old Testament. Noting that he has studied contemporary historical critical method including the “hermeneutic of suspicion,” Fr. John said that he will teach both their arguments and the venerable Orthodox alternative—specifically, a hermeneutic of filial piety to engage the texts in the spirit of the Church Fathers. Miss Purdy, the new Russian and Church Slavonic instructor, spoke about her desire to bridge the gap between ethnic parishes and converts through her teaching, allowing both sides to integrate themselves into one community with mutual understanding. The cavalcade of returning faculty began with Dr. Vitaly Permiakov, Associate Professor of Liturgical Theology, who also teaches courses in dogmatic and comparative theology. He explained his interest in the intertextuality and origins of hymnography and in reinvigorating pre-Revolutionary historical scholarship. Deacon Andre Psarev, Assistant Professor of Canon Law and Russian Church History, echoed Dr. Permiakov’s emphasis on the necessity of studying history. An understanding of the complexities of the present Russian situation, he declared, requires knowledge of historical development, which can soften the aggressive or defensive postures of many polemicists. Mr. Edward Novis, Instructor of Philosophy and English, described the patristic concept of recapitulation as his guiding principle for teaching non-Orthodox philosophy. V. Rev. Hegumen Cyprian Alexandrou, Lecturer in Biblical Greek, underscored the importance of learning foreign languages to access and popularize theological texts in Russian and Greek that have yet to be translated into English. Deacon Peter Markevich, Lecturer in Liturgics, explained the importance of scholarly study of the liturgical life, especially for the priest who must lead his parish in prayer. Finally, Fr. Alexander, Dean and Professor of Moral Theology, displayed his published books to illustrate the more than 40 years he has devoted to research in the Orthodox morality of war and peace, Church and state relations, and other topics in political ethics. Fr. Luke concluded the Fall Convocation by tracing Holy Trinity Seminary's classical Orthodox theological position from Met. Anthony Khrapovitsky through Abp. Vitaly Maximenko, the founder of Holy Trinity Seminary, to Met. Laurus Skurla. Fr. Luke observed that the long, global battle to preserve the Orthodox faith continues in contemporary Ukraine, noting the spiritual roots of Holy Trinity Seminary in Ukraine, particularly Pochaev Monastery. While scholastic work is important and a firm grasp of the history of the Russian Church Abroad is crucial, the most important focus must be on the spirit. Fr. Luke gently warned the seminarians that spiritual battles will be ongoing: the only way through them is to remember the goal for which they are striving. Then seminarians will be able to stabilize the tossings and turnings that may knock the one who is unprepared off his path. Therefore, all must defend themselves by knowing, embracing, and becoming part of the spiritual discipline that Holy Trinity Monastery and Seminary offer. After the concluding prayer, faculty, students, family, and friends gathered for an ice cream social.